Our contract manufacturing projects are managed by the Project Coordinator: she is the interface between the clients and the internal departments at Baccinex, and will be your main contact for all your requests as well during the preliminary phases of your project as well as after its finalization. Each request leads to a feasibility study in order to check our technical capacity to perform the project. On request, a confidential disclosure agreement can be established before exchanging any information for the feasibility study or before order. If the feasibility study shows that the contract manufacturing project could be performed at Baccinex, a detailed commercial offer is provided to the client. 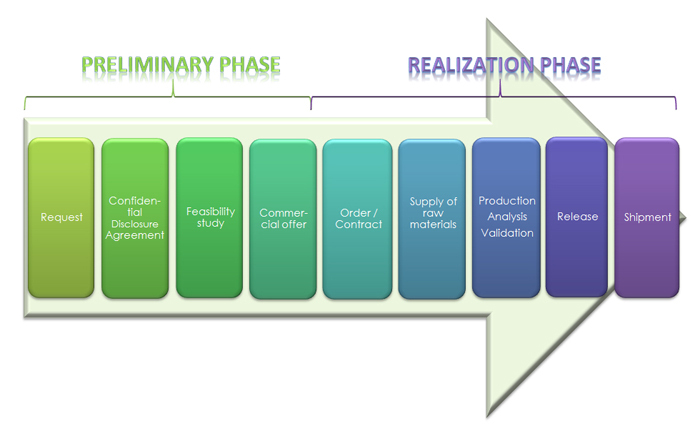 The preliminary phase ends with the order and the realization phase begins with the writing and approval of a quality agreement, detailing the specifications for the activities and the responsibility of each party. Raw materials are ordered after having received the order. The documentation concerning the project (master batch documentation) is written and approved before the start of the activities. After completion of the activities, the batch records are reviewed and the batch can be released by the qualified person. The finished product can be shipped before or after batch release according to the client’s requirement.